The more your blood sugar goes up and down, the more you gain weight and the more you are at risk for the complications of diabetes. 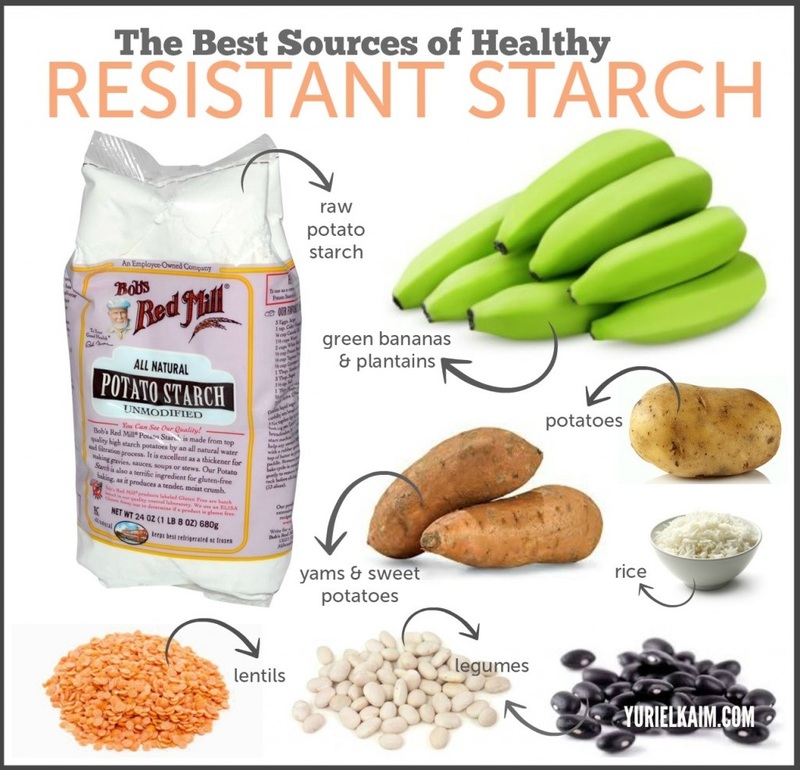 Resistant starch helps stabilize your blood sugar more than any other known compound. It has been called the skinny carb, resistant fiber, and resistant starch. Whatever you call it, research shows it can help you lose belly fat, feel full, lower your blood sugar, and increase your helpful bacteria. In fact, it was first discovered in 1984 as an effective treatment for a fatal genetic disorder that causes unstable blood sugar, called glycogen storage disease. People with this disease could never go more than 90 minutes between meals without life-threatening hypoglycemia -- even at night. Imagine never being able to sleep for more than 90-120 minutes at a time! The much more common condition, in which blood sugar is poorly controlled, is Type 2 diabetes. In this condition, people experience growth of visceral fat, fatigue, poor mental function, and numerous complications, including heart disease, cancers, kidney damage, and premature brain aging. We now know that many of these same complications occur with obesity even when diabetes is not yet apparent. Because the conditions overlap so greatly, Dr. Francine Kaufman coined the term, "diabesity," to express their interrelatedness. Which Foods Have Resistant Starch? Potatoes do, especially when boiled and refrigerated. Those with purple flesh are the highest. Beans and legumes, especially white beans like navy, northern, and cannellini beans. Unripe bananas and skin from organic ripe bananas. Yes, you can eat banana skins. How Can You Get More Resistant Starch in Your Diet? Boil potatoes with purple or red flesh, and refrigerate overnight. Dice and add ¾ cup of potatoes to stir-fry dishes AFTER heating. Add ½ cup of navy beans to your salad with lunch. Get ripe, organic bananas. Trim the stem and the tip. Cut in half, and freeze overnight or longer. Use ½ of a banana with the skin in your protein shake. Be sure to use a strong blender. Chen Y-T, Cornblath M, Sidbury JB, "Cornstarch therapy in type 1 glycogen-storage disease," N Engl J Med 310:1721-1725, 1984. Johnson EL, "Glycemic variability in type 2 diabetes mellitus: oxidative stress and macrovascular complications," Adv Exp Med Biol 2012;771:139-54. Jung U.J., Choi M.S., "Obesity and its metabolic complications: The role of adipokines and the relationship between obesity, inflammation, insulin resistance, dyslipidemia and nonalcoholic fatty liver disease," Int. J. Mol. Sci. 2014;15:6184-6223. doi: 10.3390/ijms15046184. Robertson M.D., "Dietary-resistant starch and glucose metabolism," Curr. Opin. Clin. Nutr. Metab. Care, 2012;15:362-367, doi: 10.1097/MCO.0b013e3283536931. Zhang L, Li HT2, Shen L, Fang QC, Qian LL, Jia WP, "Effect of Dietary Resistant Starch on Prevention and Treatment of Obesity-related Diseases and Its Possible Mechanisms," Biomed Environ Sci., 2015 Apr;28(4):291-7, doi: 10.3967/bes2015.040. Paredes S, Ribeiro L, "Cortisol: the villain in metabolic syndrome?" Rev Assoc Med Bras., 2014 Jan-Feb;60(1):84-92. Bird A.R., Conlon M.A., Christophersen C.T., Topping D.L., "Resistant starch, large bowel fermentation and a broader perspective of prebiotics and probiotics," Benef. Microbes, 2010;1:423-431, doi: 10.3920/BM2010.0041.